Geographically, the global veterinary dentistry instruments & equipment market has been segmented into five major regions: North America, Europe, Asia Pacific, Latin America, and Middle East & Africa. North America dominated the global veterinary dentistry instruments & equipment market in 2017, attributed to rise in number of pet animals in the U.S. and Canada, and strategic presence of key manufacturers in the region. Europe is considered to be the second most prominent region in terms of revenue in 2017, due to the dedicated oral surgical referral service for companion and farm animals. Improved penetration of key distributors such as Henry Schein, Inc. in Brazil and their efficient supply of veterinary dentistry equipment to the retail sector are the key factors projected to boost the growth of the veterinary dentistry instruments & equipment market in Latin America during the forecast period. Establishment of numerous organizations aiming to improve clinical efficiency of pet care in South Africa is anticipated to fuel the growth of the market in Middle East & Africa during the forecast period. However, the market in Asia Pacific is expected to expand at a high CAGR from 2018 to 2026, owing to increase in awareness about oral care for pets in China and Japan, and well-established veterinary dentistry industry in Australia. Key companies operating in the global veterinary dentistry instruments & equipment market and profiled in the report include Acteon Group, Dentalaire International, MAI Animal Health, TECHNIK TECHNOLOGY Ltd, Jorgen Kruuse A/S, Dispomed Ltd., iM3Vet Pty Ltd., Integra LifeSciences Holdings Corporation, Henry Schein, Inc., and Patterson Companies, Inc.
Veterinary dentistry comprises every activity related to animal oral care. It involves examination and cleaning of teeth of animals, tooth extraction, oral surgery, and treatment of periodontal disease. Veterinary dentistry equipment & instruments are handheld or powered tools that are used by veterinary dentists to perform procedures such as removal of tooth calculus or plaques, repairing the tumors of oral soft and hard tissues, and extraction of tooth. Increase in awareness about oral hygiene of animals and rise in disposable income of the population in developed countries are the key factors driving the global veterinary dentistry equipment & instruments market. According to the Animal Medical Center of Wyoming, 80% of dogs and 70% cats develop periodontal disease by the age of 3. Rise in prevalence and incidence rates of periodontal diseases and gingivitis among animals are expected to boost the growth of the global market during the forecast period. The global veterinary dentistry instruments & equipment market report comprises an elaborate executive summary, which includes a market snapshot that provides information about various equipment types in the market. It also provides information and data analysis of the global market with respect to the equipment types and region. A detailed qualitative analysis of drivers and restraints of the market and opportunities has been provided in the market overview section. Additionally, the section comprises competitive matrix and company profiles with business overview to understand the competitive landscape in the market. This section of the report also provides market attractiveness analysis, by region and market share analysis by key players, thereby presenting a thorough analysis of the overall competitive scenario in the global veterinary dentistry instruments & equipment market. Based on equipment type, the global veterinary dentistry instruments & equipment market has been segmented into oral examination instrumentation, periodontal therapy equipment & instrumentation, tooth extraction instruments & equipment, and ancillary equipment. The oral examination instrumentation segment has been classified into periodontal probes, dental explorers, mouth gags, and dental mirrors. The periodontal therapy equipment & instrumentation segment has been categorized into scaling equipment (hand instruments and powered equipment) and polishing equipment. The tooth extraction instruments & equipment segment has been bifurcated into hand instruments (luxators, elevators, extraction forceps, root-tip picks, Minnesota retractors, scalpel blades, and others) and powered equipment (micromotor units, compressed-air-driven units, and burs). The ancillary equipment segment has been divided into magnifying loupes and dentistry tables. All the segments have been analyzed based on new product launches, regional demand for equipment, regulatory policies for the equipment, and ongoing R&D on the novel veterinary dentistry instruments & equipment. The market size and forecast for each of these segments have been provided for the period from 2016 to 2026, along with their respective CAGRs for the forecast period from 2018 to 2026, considering 2017 as the base year. 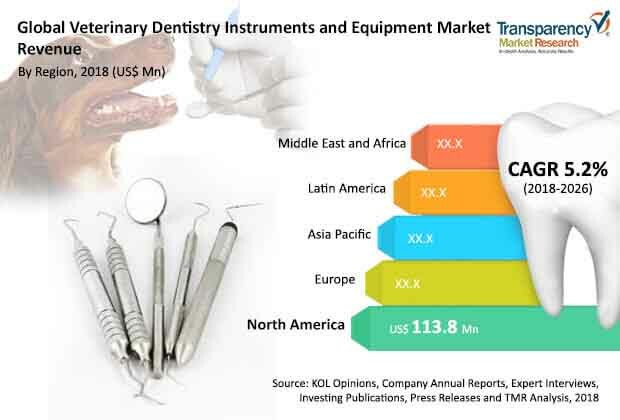 Geographically, the global veterinary dentistry instruments & equipment market has been segmented into five major regions and key countries in respective region: North America (the U.S. and Canada), Europe (the U.K., Germany, France, Italy, Spain, Russia, and Rest of Europe), Asia Pacific (China, Japan, India, Australia & New Zealand, and Rest of Asia Pacific), Latin America (Brazil, Mexico, and Rest of Latin America), and Middle East & Africa (South Africa, GCC Countries, Israel, and Rest of Middle East & Africa). The market size and forecast for each of these regions and the mentioned countries have been provided for the period from 2016 to 2026, along with their respective CAGRs for the forecast period from 2018 to 2026, considering 2017 as the base year. The research study also covers the competitive scenario in these regions. The report also profiles the major players in the market in terms of various attributes such as company overview, financial overview, product portfolio, business strategies, and recent developments. Major companies profiled in the global veterinary dentistry instruments & equipment market are Acteon Group, Dentalaire International, MAI Animal Health, TECHNIK TECHNOLOGY Ltd., Jorgen Kruuse A/S, Dispomed Ltd., iM3Vet Pty Ltd, Integra LifeSciences Holdings Corporation, Henry Schein, Inc., and Patterson Companies, Inc.